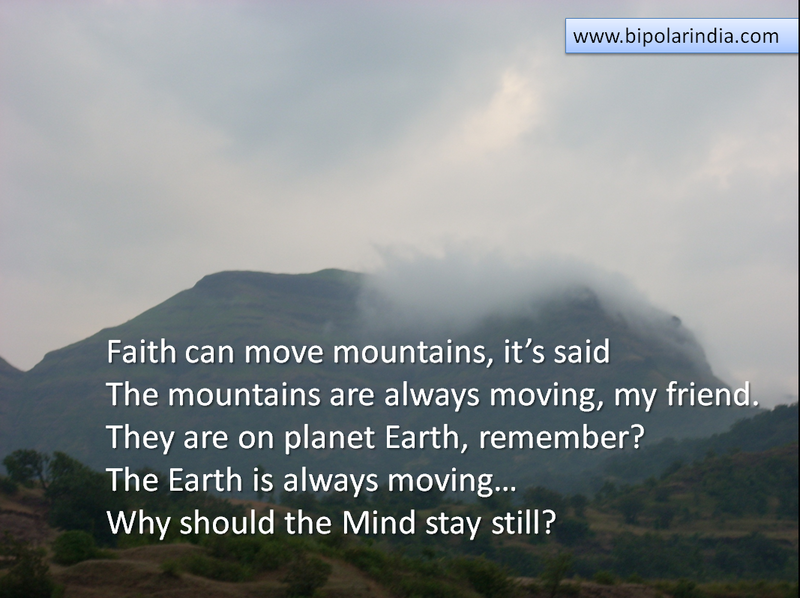 Acceptance is your first step towards bringing Bipolar to manageable proportions. This not only applies to those struggling with Bipolar but also with other major chronic, debilitating conditions. You are doing yourself no favour by choosing to live in a fool’s paradise. Refusing to acknowledge the gravity of Bipolar and resisting it tooth and nail is the road to certain disaster. Let me illustrate. Imagine facing a huge wide wall. You are attempting to push it backwards away from yourself while standing on a slippery, greasy floor. The harder you push, the greater the chances you’d fall flat on your face. Acceptance on the other hand, makes you sit calmly and assess the situation. You know that by staring at the wall it is not going to disappear. By focusing on something else, the wall gradually becomes less intimidating. Therefore, the FIRST and possibly most important step you need to take on this journey is to accept that you are a Bipolar, which is a serious Mental illness that needs to be treated by a Psychiatrist and that the prescribed medication HAS to to be part of your new regimen. This cannot be emphasised enough. Managing troublesome relationship issues and career problems also become easier for those who learn to accept. Clarity is required on one aspect: acceptance is acknowledgement of a issue that needs to be resolved and finding a pragmatic, mature way to deal with it. It is by no means admitting defeat. I recently read about an athlete with a prosthetic leg (possibly as a result of an accident) who successfully climbed the Mount Everest. Throughout history you’d come across persons who have overcome immense tragedy or physical debility yet lived a winner’s life. The legendary Helen Keller, Stephen Hawking (the Quantum Scientist) who cannot move a single muscle and many others from the sporting arena are stellar examples. What separated them from the rest is their attitude to life: accept the situation however difficult it is, treat it as a challenge and overcome it. Of course, these legends went beyond overcoming it for their own fulfilment- their positive attitude and legacy made them lasting sources of inspiration. Focus on the bigger, brighter picture (however difficult it might be). Make a self proclamation that you are on the path to recovery and well-being. This is just a passing phase, you’ll conquer it just as you have overcome so many challenges in your life. Draw inspiration from your past achievements, your moments of glory. No, you are not a no-hoper, you were born to be a winner. We have discussed how you take a massive stride forward with the help of right mental preparation. Steps 1) and 2) are half the battle won! However, all your efforts (and your Doctor’s) will be nullified if you quit treatment midway. 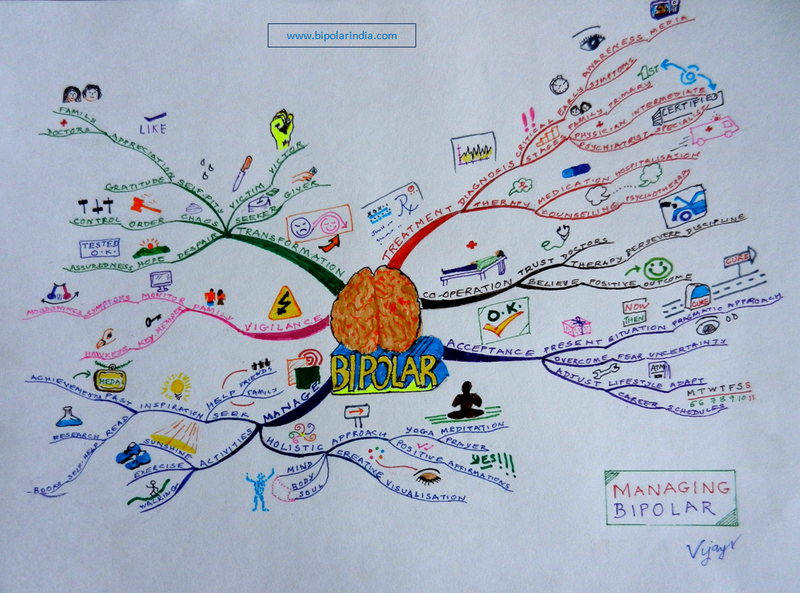 Managing Bipolar and its devastating impact is a long drawn process, NOT a one time ‘fix it, forget it’ job. By quitting therapy, the relapse could be deadlier than you could ever imagine. Keep the big picture in mind. The treatment, however troublesome and long drawn is now a part of your life, just as it is for all chronic conditions such as Diabetes, Cardiac ailments, etc. The side effects of the medication might be bothersome but remember they are not half as bothersome as uncontrolled Bipolar symptoms. Think of your family, what you owe to them. You owe yourself a normal, joyful life too. Still have thoughts of quitting your treatment? Consult your Psychiatrist first! The Medical regimen forms the base of your treatment. Give it more strength and direction by learning and practising Yoga, Meditation and Creative Visualisation techniques. Spirituality brings in a much needed sense of detachment, calmness and grounding. Physical fitness through daily walking, light exercises are known Mood elevators. Take up some creative hobbies, keep yourself occupied. Increase your social interaction to boost your confidence. I had the experience of drawing from numerous challenges overcome by me in the past. Do not want to dwell on that aspect here. Am touching another facet of it. In fact as I write this, just today a relative of mine brought up this very point during our phone conversation. Although I repeat this conversation verbatim, doesn’t this sound familiar? We make or break our own future. In my case, I hold no one except myself responsible for any outcome in my life. Her words (otherwise a healthy, normal woman) reflected a defeatist attitude, full of despair driven by her depressing circumstances. I said to her, if you believe you have no future, you are right, you stand no chance at all. 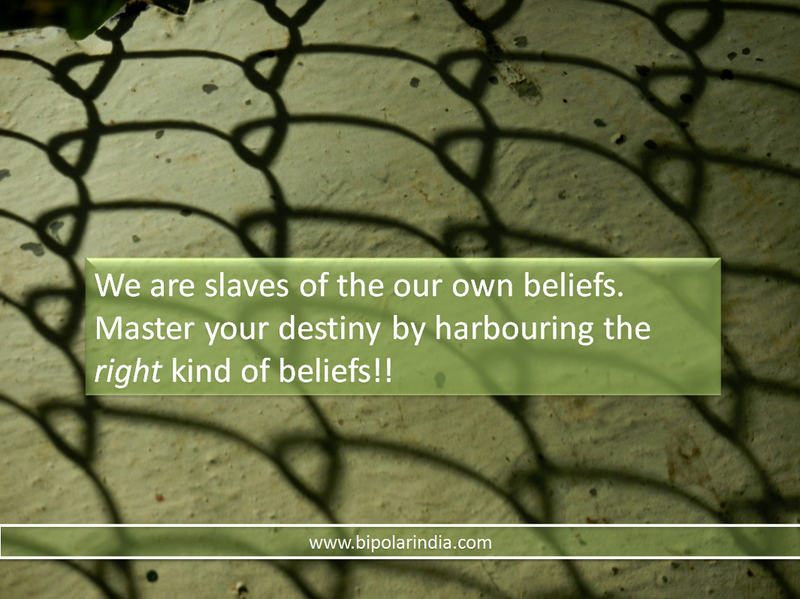 It is your self belief that counts. Plan a great future for yourself, believe it will be yours. The reason I narrate these incidents is that this same lack of belief and courage stops many of us from from crossing the smallest of hurdles. My answer to this is and I state this with all modesty, I am not special. I am extraordinary! The point is, so are you! It is my my firm belief each one of us has that spark within us..a glimmer of hope..the faith not yet eroded by all the assaults on it…the belief that somebody wants us to win. Any person can ignite this spark to find inspiration: all it needs is faith. Focus: Begin with the end result in mind, then take small baby steps towards that goal, one at a time. Use Positive affirmations to boost your motivation. My own decade long battle with Bipolar has not been a walk in the park. The Positives I have taken from it are that I am now a much stronger, balanced person and I can say with pride that I have taken whatever life has thrown at me with dignity. A brilliant future awaits me. No major battle is ever won alone, family and friends have stood by me through all this. God has always been my driving force. Giving me hope when there was none. My question to all of you is, why would He be so kind to just one of the creatures of His making? All you have to do is ask Him. Faith can move mountains..